of 23 soil samples recently processed for a commercial dairy farm in Vermont had 20 fields that needed 2 or more tons of lime/acre (many needed more than 3); 22 were critically low in phosphorus; 19 were critically low in potassium; and over a third were critically low in magnesium. Putting the manure (lime, wood ash, etc.) where you need it most desperately will pay you back the most. At this point it is very important to note that the farmer above would not know the nature of his problem if they had not tested: applying manure without a current soil test is akin to shooting without aiming. 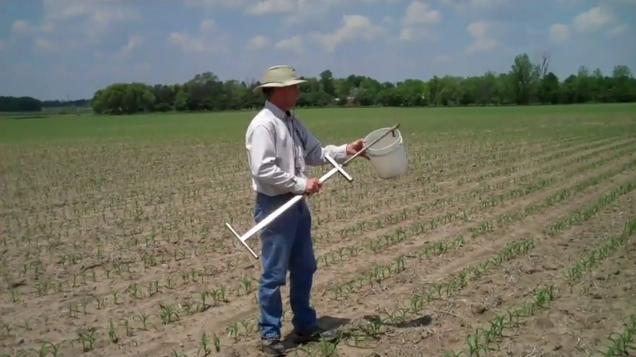 Soil test reports that are less than three years old usually offer good guidance. If you do not have a current soil test and you want your manure-spreading efforts to pay you back as much as possible, test before you spread. Testing in the fall has the added benefit of giving you time to apply lime or wood ash in the fall to correct soil acidity where it exists. Freezing, thawing, water percolation, time, and microbial activity allow fall-applied lime applications to make more progress toward a neutral soil pH than if it is spring-applied. Get a soil probe. Getting a soil sample without a soil probe (or auger), is like having your blood tested without a needle: it can be done, but not nearly as well as if you have the right equipment. You can order them online from places like Gemplers, Ben Meadows, and Grainger: just Google ‘soil probe’ and you will find options running from $40 to $150+. Like anything else you get what you pay for. If you are a quality-focused person, get a really stout probe with a replaceable tip. If you are more price-sensitive at the moment, get an inexpensive probe, but be gentle with it because they are generally made of thinner steel and will not stand up to abuse. and 38 pounds of phosphate; and between 0.7 and 50 pounds of potash! You can’t know unless you test. Other forms of manure are comparably variable. The one cup soil sample you submit to the lab is supposed to be representative of millions of pounds of soil in your field. The single sample of manure you submit may represent tens of thousands of gallons or hundreds of tons of manure. If you count on manure as a cost-efficient product to improve or maintain soil fertility and productivity, you need to know the nutrient content of the material you are working with. Always remember that your samples will only be as representative of the soil or manure as your testing procedures are valid. If you have any questions about soil or manure sampling please contact your local Extension agronomist or nutrient management specialist or contact me at daniel.hudson@uvm.edu .